Physical development for a baby is an important part of growing up. There are many businesses that now provide physical development classes for young babies such as My Gym. However, what can you do for yourself at home? Play mat, activity mat, activity gym, jungle gym- these are all items that have the same purpose. To provide your baby with a safe place to engage and play with toys while lying down or on tummy time in your own home. One of the main purposes of a baby jungle gym is to help your little one develop hand-eye coordination, lengthen eyesight, provide tactile stimulation and increase motor development. Since a baby’s development range can vary so much, we have divided our recommendations into recommendations for a newborn or non-crawling baby and recommendations for a crawling baby. Based on these factors, we recommend these fantastic 7 baby jungle gyms. The Infantino Ball Pit is a great baby jungle gym to grow with your baby and encourage your baby’s development. When your little one is still a newborn, you can set up the toy arch with 4 hanging sea toys (octopus, fish, crab with a mirror and starfish). 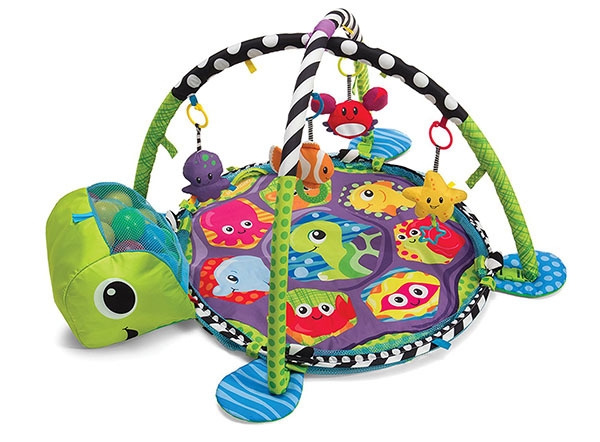 The play mat itself is in the shape of a turtle with multicolored sea creature designs. The turtle’s head doubles up as a bag for 40 multicolored balls. These balls will be especially engaging for an older baby that is learning to crawl. With a variety of textures and activities, this is a versatile and value-packed baby jungle gym! 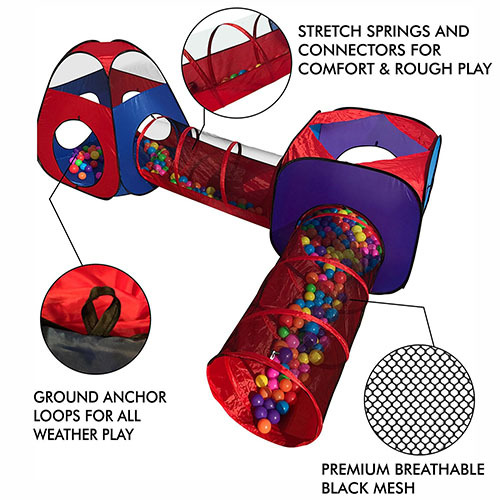 The Skip Hop Activity Gym is uniquely designed to encourage your baby’s physical development. It has a two-position arch (top or side) so that you can vary the level of the hanging toys to suit your baby while lying down, on tummy time or sitting up. 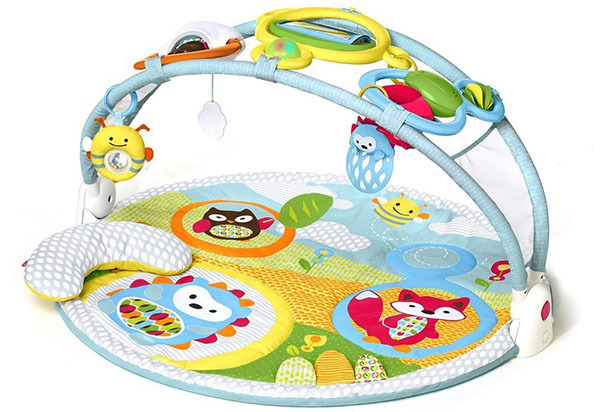 This play gym comes with 20 developmental activities including a peekaboo owl that hoots when its string is pulled, a musical teether, a sound-activated dancing fox and crinkle flaps. It also comes with a U-shaped pillow for tummy time practice and a mirror. But most interestingly, the arch is designed to hold a cellphone so that you can play music on your cell phone or let your baby video chat with relatives while using the play mat. The play mat is made of BPA-free, PVC-free and also phthalate-free materials. 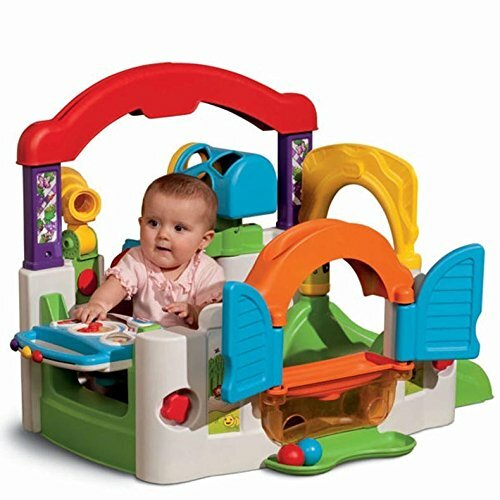 This VTech Baby Gym is a greatly affordable jungle gym to get to encourage your baby’s physical development. 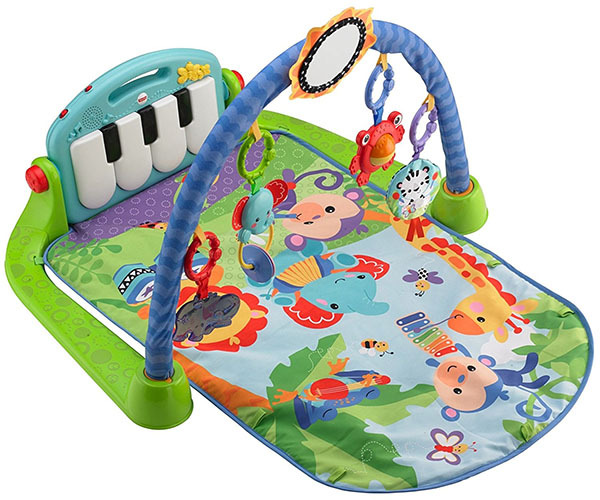 It encourages your baby to practice kicking at the colorful keys to make music and lights play. 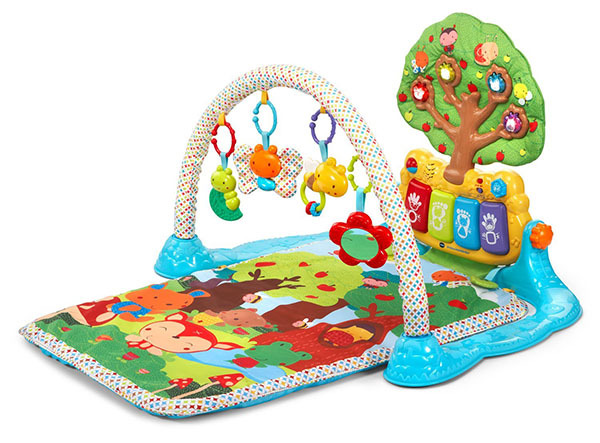 Towards the middle of this baby play mat, there is an overhanging arch where 4 toys with a variety of textures including hard and soft materials are dangling to entice your baby to reach out and interact. Once your baby is ready to move a little bit more, the large green tree above the keyboards will entice your baby to reach out to press the buttons on it. The keyboard can be angled to face up so that it can still be used when your baby is sitting up. The toys are BPA-free and conform to US toy safety standards. The Fisher-Price Kick and Play is another great baby jungle gym for newborns because it encourages your baby to kick! 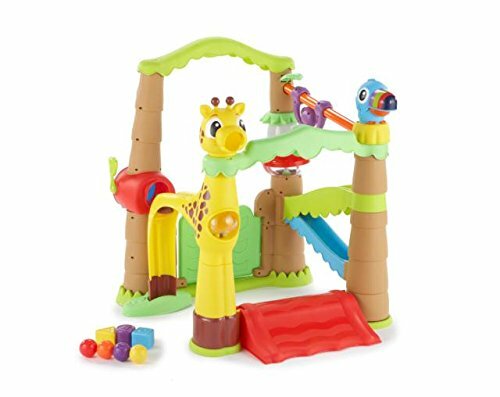 Just like the VTech Baby Glow Gym, this baby jungle gym comes with an overhanging arch with a variety of toys and a keyboard that plays music when the buttons are pressed. It is designed to encourage newborns to practice kicking their legs and will help with leg muscle development. Once your baby is ready to sit up, the keyboard can be adjusted to face up. The baby jungle gym is colorful and there is the option of short or long-play music to keep your child occupied for up to 15 minutes. This Tikes Activity Garden is great for soon-to-be or current crawlers. It has a crawl-through obstacle course made up or arches and a ramp. To promote tactile development, there is also a mailbox, a telescope, open-and-shut doors and windows, a piano, a mirror, learning clock, ball shaker, clicking bugs and a trilingual telephone (English, Spanish and French). All of these interactive features will encourage your baby to move around and explore! This Activity Garden Little Tikes. This baby jungle gym uses dancing, multicolored lights, and music to encourage your baby to move, disco-style. Your baby is encouraged to capture “fireflies” and to place these in a “magic lantern”. Like the original Tikes Activity Garden, this jungle gym also has an obstacle course made up crawl-through-arches and a ramp. In addition, it has several ball feeders, swinging doors, doorbell, and clock. This set also comes with 4 multicolored balls for your baby to test on the slides. Technically, this is not a baby play mat but it does qualify as a fun baby jungle gym! The Playz Pop Up Children Play Tent encourages your baby to crawl through 2 tunnels and 2 tents. These structures can be separated or used all together. The materials are lead, latex, phthalates and BPA-free. Encourage your baby to practice his or her crawling skills and you can even set up obstacles or rewards along the way. Especially suitable for children parties. Now it’s time to watch your baby on the go!